Add a whimsical touch to your outdoor décor with the Heartwood Rusty Rooster Bird House. Drop siding and corner boards make up the structure of the sparkling white home, while gleaming copper forms the roof of the house and of the decorative cupola. Atop the roof, a Rusty Rooster finial perches, keeping watch over your lawn or garden. The finial unscrews, allowing you to lift the roof off for seasonal cleanouts. 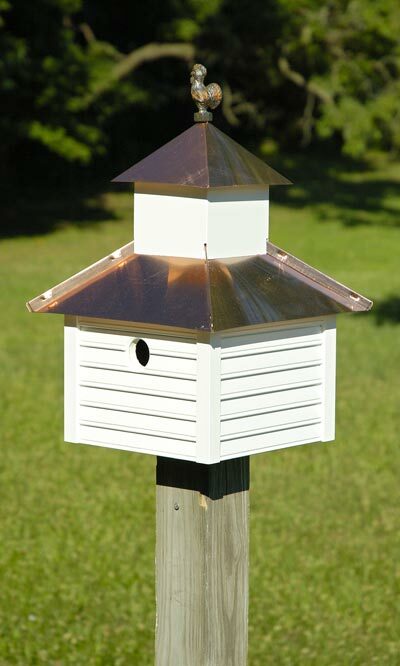 Bring farmyard flair to your birding sanctuary with the Rusty Rooster Bird House. Use the included mounting bracket and screws to affix this house to a post. Made in the USA.